As the first Mario platform game released on the Wii, Super Mario Galaxy generated significant excitement from trade shows and on the Internet long before its release date. This is the third 3D adventure for Mario after Super Mario 64 and Super Mario Sunshine, this time he will take on new challenges in outer space. 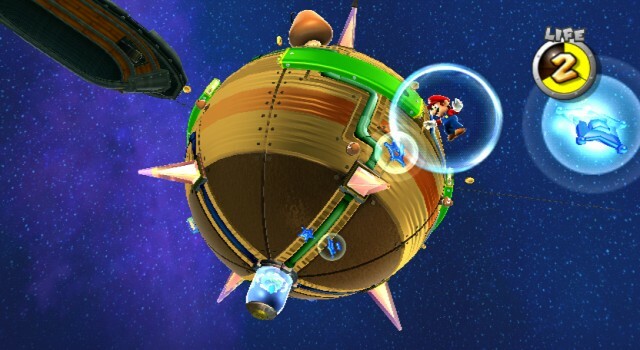 At first glance, Super Mario Galaxy does appear to be similar to its two 3D predecessors. Once again, Mario is set to rescue Princess Peach from Bowser, as in almost all other Mario games. But this time around, Mario can move around different galaxies, planets and objects. Instead of the usual flat levels that have been in previous games, you are now able to go around entire planets and even objects as each of these have its own centre of gravity. There are parts of many levels where there are pseudo-2D parts where you have to follow a particular path, and there are also places where you can change the direction which way gravity goes! In past games, you normally "die" when you fall into a hole or off a cliff. But in Super Mario Galaxy, you can literally walk around any large object. But there are places with "black holes", where you can get sucked in by them if you fall off an edge - much like in the past games. This game has less tedious collecting tasks and has more of a focus on reaching a goal at the end. Compared to the last platform game, Super Mario Sunshine on the GameCube, Super Mario Galaxy is much less tedious and less frustrating. The level design is very fluid and less reliant on open areas; generally it feels more of a 2D game in a 3D world. The camera angles used in the game have improved significantly compared to the past games which often a struggle. The style of play results in more of a classic feel and is like paying homage to its NES and Super NES predecessors. There are many tasks that involve Mario trying to reach the end of the level by going jumping through platforms, avoiding enemies and gaining power-ups. Lots of familiar enemies like Boos, Koopa Troopas, Goombas and Piranha Plants are also there to greet you. There are even the irritating fire bars that spin around! There are a variety of tasks in Mario's mission to collect 120 stars, including races, coin collection, puzzle solving and boss battles. The different tasks make Super Mario Galaxy a fun game to play as there is are always something new and exciting that will come up. As in almost all Mario games, some levels will definitely take a lot of practice to succeed and at times get frustrating, but overall the game is very fair to play. Both the Wii remote and nunchuk are used in Super Mario Galaxy and it makes excellent use of both parts of the Wii controller package. It's almost as if the hardware was designed for this game, the controls are simple and easy to use, but yet there is so much you can do. As in previous games, the control stick is used to control movement, and it's possible to jump using the "A" button on the remote. Shaking the Wii remote allows Mario to do a spin attack, doing this while jumping also makes him jump higher. The Mario-style long jump and wall jumps are still in the game, and the camera can be controlled using the control pad. The standard controls are not difficult to learn for those who have played Super Mario 64 and Super Mario Sunshine. However, getting used to the gravity, and playing upside down or sideways in some cases might take some time to adjust to! The game even makes use of the Wii remote's pointing capabilities, as you play, you can use the remote to point at star bits throughout the screen. If you point at a star bit, you will collect it, and collecting 50 of them will earn you a 1-up, and it's also possible to open up different areas by trading in star bits. If that isn't enough, it's also possible to "shoot" star bits at enemies as well by pointing and hitting the "B" button! However star bits are abundant and it is not difficult at all to collect a large number of them. There are also other fun things you can do that were made possible by the remote. It's possible to "pull" Mario into objects that have a gravitational pull, and also to "fling" around like a slingshot in some places. It feels very intuitive and it's neat how the developers put this into the game. The types of levels found in Super Mario Galaxy provide the player unique experiences, it is just extremely cool to see Mario skate around on ice in the snowy levels, navigate the lava stages, swimming into the ocean, visit ghost houses and castles; there is just so much to see around the galaxy. 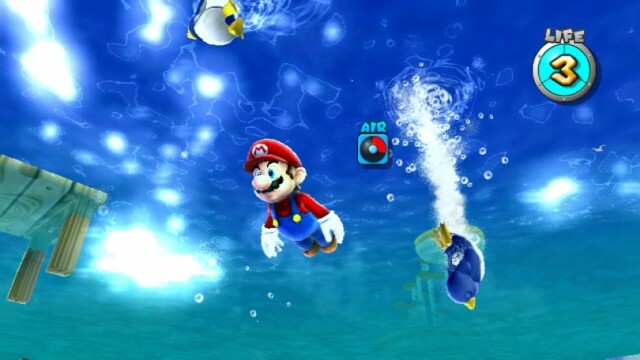 There is a lot of variety compared to Super Mario Sunshine, which was based on an aqua theme. Having a space theme allowed the developers to do all sorts of things without worrying whether something fits into the game. Mario also has some new power-ups to use. It's now possible for Mario to turn into a Boo, Bee or Spring. These new powers let Mario reach different areas that are let's say, less traditional. The fire flower also makes a return allowing Mario to shoot fireballs, and there's also an ice flower which lets Mario shoot ice balls that let him walk on frozen lava. For a Wii game, Super Mario Galaxy has great graphics. The textures are well defined, and it doesn't feel blocky like some other titles on the console. The different environments in the game are represented nicely, and feel very colourful, much like a living cartoon. Though the Wii isn't a very powerful console, there are still great graphical effects throughout the game. The music in Super Mario Galaxy is simply fabulous. There are some remixed Mario tunes from the past, which bring back great memories. Many tracks that can be heard in the game were recorded by a live orchestra that provides an excellent feel to the game. There are a mixture of tunes that are marches and solemn songs that fit the type of level that you are in. For example, the music found in the Rosalina's Comet Observatory - the game's main hub, has a very calm, soothing melody. As you collect more stars, there is more "power" in the observatory and the song becomes richer with more instruments. These little things in the game show that the developers paid close attention to detail. With regard to the sound effects have your typical Mario fanfare, and as usual Mario says only a few words. For the most part, other characters do not say much either as their dialog is usually presented as text on the screen. Mario games often make references to the past. There are always things that you recognize from past games, such as enemies , objects and items. For example, Mario can swim faster by holding a Koopa shell, just like in Super Mario World. There are all sorts of familiar tunes and game elements. Those that have followed the Mario series often get this warm feeling when they encounter something familiar, there is always some sort of continuity between different games. 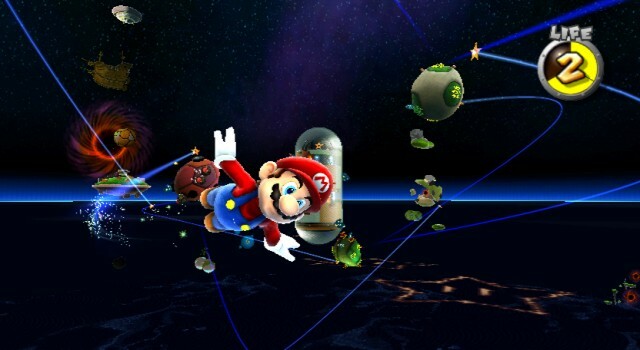 Super Mario Galaxy is not a very difficult game, indeed it can be completed with only 60 of the 120 power stars. But that being said, it takes quite a bit of time to get all the stars, so for fans of the Mario series that strive for perfection, there is plenty of replay value in the game. Super Mario Galaxy is one of the best titles released on the Wii to date. The Wii has mostly been marketed towards casual gamers and there are fewer traditional games, but this is a game that will be fun for both new and old players. While the plot is recycled, and there are the typical recurring Mario themes, overall it's a nice package. 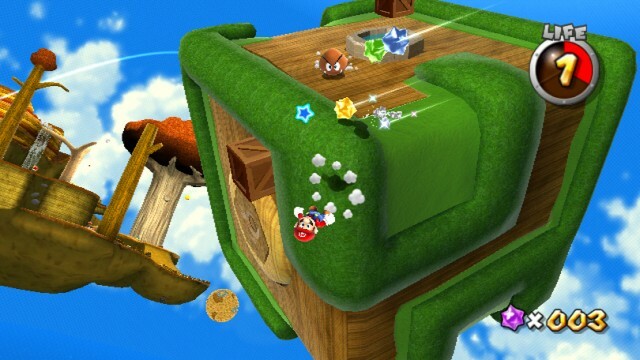 The Wii controls give Super Mario Galaxy a unique experience that is new to 3D platform games. To many people, Super Mario Sunshine was a disappointment. But this time Nintendo has refined their formula and Super Mario Galaxy is a success, and it is a game that is both fun and entertaining to play. Super Mario Galaxy is the game that Mario fans have been long waiting for, it won't disappoint. This is the true sequel to Super Mario 64.